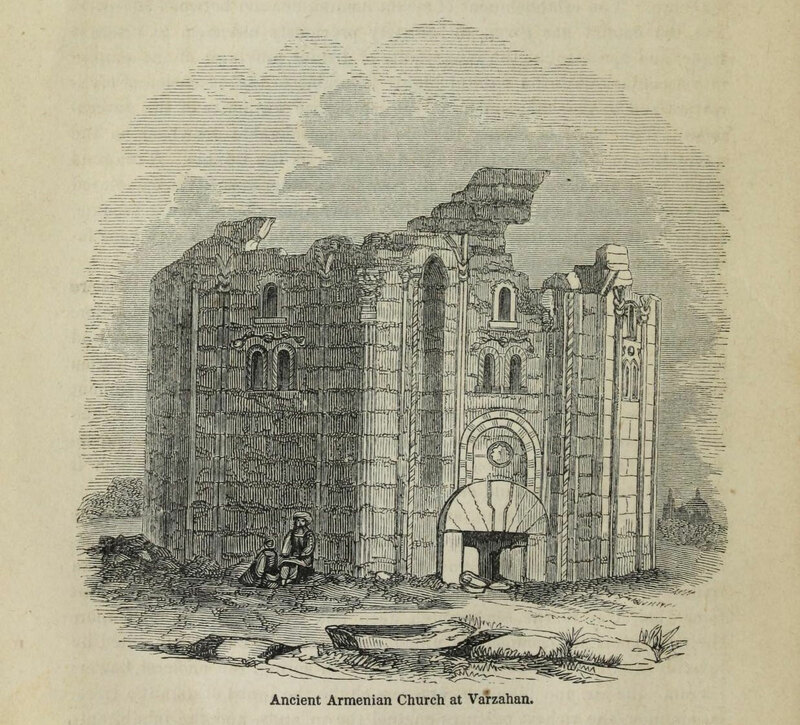 In his book “Discoveries among the ruins of Nineveh and Babylon : with travels in Armenia, Kurdistan, and the desert…” published in 1859 Sir Austen Henry Layard recounts his discoveries in Asia Minor and Middle east. I would like to share with you here a few notable passages regarding Armenia accompanied with illustrations from his book. The only place of any interest, passed during our ride, was a small Armenian village, the remains of a larger, with the ruins of three early Christian churches, or baptisteries. These remarkable buildings, of which many examples exist, belong to an order of architecture peculiar to the most eastern districts of Asia Minor and to the ruins of ancient Armenian cities, on the borders of Turkey and Persia. There are many interesting questions connected with this Armenian architecture which will deserve elucidation. From it was probably derived much that passed into the Gothic, whilst the Tatar conquerors of Asia Minor adopted it, as will be hereafter seen, for their mausoleums and places of worship. It is peculiarly elegant both in its decorations, its proportions, and the general arrangement of the masses, and might with advantage be studied by the modern architect. Indeed, Asia Minor contains a mine of similar materials unexplored and almost unknown. This of course is not the first nor the last time that Armenian architecture is said to have influenced the Gothic architecture. Joseph Strzygowski (1918) in his book “Die Baukunst der Armenier und Europa“ has argued that tenth-century Armenian monuments have been the forerunners of Gothic architecture which came to Europe several centuries later. The clustered piers, the pointed arches and vaults, which had also been used by Trdat in the churches of Argin and Horomos, remind one of early Gothic architecture, but these forms appear in Armenia about a hundred years before they come into use in Western Europe. J. Baltrusaitis in his “Le problème de l’ogive et l’Arménie” published in 1936 calls attention to other interesting similarities with Gothic art that appear in a number of Armenian monuments from the end of the tenth through the thirteenth century. In several other passages Layard recounts some of ancient Armenian cities he encounters on his journey. Among many he recalls Khelath (Ahlat) and Wan (Van). The lofty perpendicular rocks rising on both sides are literally honeycombed with entrances to artificial caves, ancient tombs, or dwelling-places. On a high isolated mass of sandstone stand the walls and towers of a castle, the remains of the ancient city of Khelath, celebrated in Armenian history, and one of the seats of Armenian power. I ascended to the crumbling ruins, and examined the excavations in the rocks. The latter are now used as habitations, and as stables for herds and flocks. The ancient city of Khelath was the capital of the Armenian province of Peznouni. It came under the Mohammedan power as early as the ninth century, but was conquered by the Greeks of the Lower Empire at the end of the tenth. The Seljuks took it from them, and it then again became a Mussulman principality. It was long a place of contention for the early Arab and Tartar conquerors. Shah Armen reduced it towards the end of the twelfth century. It was besieged, without result, by the celebrated Saleh-ed-din, and was finally captured by his nephew, the son of Melek Adel, in A.D. 1207. We passed through Vastan; in the eleventh century the residence of the royal Armenian family of Ardzrouni, but now a mere village. The convent boat was on the beach, three miles above the usual landing-place. Four sturdy monks were about to row it back to the island. As they offered to take me with them, I left the caravan to journey onwards to our night’s encamping place, and with Mr. Rassam and the Bairakdar, we were soon gliding over the calm surface of the lake. Not a breeze rippled the blue expanse. The burning rays of the sun were still full upon us, and the panting boatmen were nearly two hours before they reached the convent. In the absence of the Patriarch we were received by an intelligent and courteous monk named Kirikor. His hair, as well as his beard, had never known the scissors, and fell in long luxuriant curls over his shoulders. It was of jetty black, for he was still a young man, although he had already passed twenty years of a monastic life. He led us through an arched doorway into the spacious courtyard of the convent, and thence into an upper room furnished with comfortable divans for the reception of guests. Tea was brought to us after the Persian fashion, and afterwards a more substantial breakfast, in which the dried fish of the lake formed the principal dish. Kirikor had visited Jerusalem and Constantinople, had read many of the works issued by the Venetian press, and was a man of superior acquirements for an Armenian monk of the orthodox faith. The church, which is within the convent walls, is built of the sandstone of a rich deep red color that has been quarried for the turbehs of Akhlat. Like other religious edifices of the same period and of the same nation, it is in the form of a cross, with a small hexagonal tower, ending in a conical roof, rising above the centre. The interior is simple. A few rude pictures of saints and miracles adorn the walls, and a gilded throne for the Patriarch stands near the altar. The exterior, however, is elaborately ornamented with friezes and broad bands of sculptured figures and scroll work, the upper part being almost covered with bas-reliefs, giving to the whole building a very striking and original appearance. I know of no similar specimen of Armenian architecture, and I regret that time would not allow me to make detailed drawings of the edifice. In a grave-yard outside the church are several most elaborately carved tombstones belonging to the early Armenian patriarchs. That of Zachariah, who died in the fourteenth century, and who was for one year patriarch at Echmiadsin and for nine years at Akhtamar, is especially worthy of notice for the richness and elegance of its ornaments. The convent and church are built on a small rocky island about five miles from the shore. On an adjacent islet are the ruined walls of a castle partly covered by the rising waters of the lake. Late in the afternoon, accompanied by the monk Kirikor, I was rowed to the farm and garden belonging to the convent, near the village of Ashayansk. A few monks live on the farm, and tend the property of the convent, supplying the Patriarch with the produce of the dairy and orchards. They received us very hospitably. Kirikor rode with me on the following morning as far as the large Armenian village of Narek, in which there is a church dedicated to St. George, much frequented in pilgrimage by the Christians of Wan and the surrounding country. It is a strong solid building, of the same red sandstone as the tombs of Akhlat. Regarding some of the more ancient inscriptions found at Van from the times of Urartu, Layard mentions the various different toponyms given to the kingdom in different tongues. 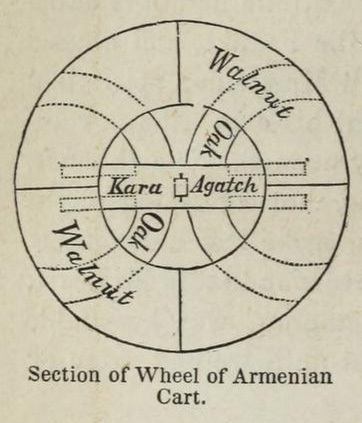 In the Khorsabad inscription Arghistis is called king of War-ar-di, apparently the genitive case of War-ar-ad, a name that may be identified with the biblical Ararath, the kingdom of Armenia. But at Wan we have two different names for this country. In the oldest inscriptions (those in the Assyrian language) it is called Nahiri, a name which, as I have already mentioned, was applied by the Assyrians to the very northernmost part of Mesopotamia, if it can be called Mesopotamia at all, between the head-waters of the Tigris and Euphrates. In the others it is termed Biaynee, a name not yet identified, but perhaps not unconnected with the mountainous province of Adiabene, to the north of Assyria. For an explanation of different toponyms of the Kingdom of Van (Urartu/Ararat) read Toponyms Armenia and Urartu. Besides recalling ancient Armenian cities overrun by the Tatars and the Arabs, Layard recounts Armenian rural life where he mentions Armenian weaving traditions and harvesting. It is chiefly inhabited by Armenians, an industrious and hardy race, cultivating the sides of the mountains, on which are built their villages, and weaving in considerable quantities the gay-colored woollen stuffs so much esteemed by the Kurds. In nearly every house was a loom, and the rattle of the shuttle came from almost every door. The mountains produce galls, wool (some of which has the same silky texture as that of Angora), the small under-wool of the goat called teftik (a valuable article of export), and minerals. Leaving the Nazik Gul we entered an undulating country traversed by very deep ravines, mere channels cut into the sandstone by mountain torrents. The villages are built at the bottom of these gulleys, amidst fruit trees and gardens, sheltered by perpendicular rocks and watered by running streams. They are undiscovered until the traveller reaches the very edge of the precipice, when a pleasant and cheerful scene opens suddenly beneath his feet. He would have believed the upper country a mere desert had he not spied here and there in the distance a peasant slowly driving his plough through the rich soil. The inhabitants of this district are more industrious and ingenious than their neighbours. They carry the produce of their harvest not on the backs of animals, as in most parts of Asia Minor, but in carts entirely made of wood, no iron being used even in the wheels, which are ingeniously built of walnut, oak, and kara agatch (literally, black tree -? Thorn), the stronger woods being used for rough spokes let into the nave. The plough also differs from that in general use in Asia. To the share are attached two parallel boards, about four feet long and a foot broad, which separate the soil and leave a deep and well defined furrow. We rode for two or three hours on these uplands, until, suddenly reaching the edge of a ravine, a beautiful prospect of lake, woodland, and mountain, opened before us. In another passage Layard recalls Armenian plowmen chanting a song to which the animals respond with great sensitivity. Next day we forded a branch of the Zab, and entered the valley of this great confluent of the Tigris, its principal source being but a few miles to the north of us, near the frontiers of Persia. The land is so heavy, that the rude plough of the country requires frequently as many as eight pairs of oxen. The Armenian ploughmen sit on the yokes, and whilst guiding or urging the beasts with a long iron-pointed goad, chant a monotonous ditty to which the animals appear so well accustomed, that when the driver ceases from his dirge, they also stop from their labors.